This species is accepted, and its native range is Eritrea to S. Africa, Arabian Peninsula. Shrub or small bushy tree, spiny, quite glabrous except for a few brown hairs at the apex and base of the petioles; bark smooth, peeling in yellowish strips. Leaves 3-foliolate; petiole up to 2·5 cm. long; terminal leaflet up to 2·6 × 1·4 cm., narrowly obovate or obovate, apex acute (often truncate to the north of our area), base gradually cuneate; lateral leaflets about half the size of the terminal ones, broadly obovate or ovate, apex acute, base broadly cuneate; margin of all leaflets coarsely crenate in the upper half. Flowers appearing before the leaves in axillary abbreviated clusters, often borne on the spines; pedicels c. 1 mm. long. Calyx 1·5 mm. long, lobed to 1/3-way or less. Petals c. 3·5 mm. long. Disk-lobes 4, ± bifid at the apex. Fruits c. 1·3 × 0·8 cm., ellipsoid to m globose, slightly apiculate at the apex; pseudaril apparently absent; endocarp c. 0·75 × 0·5 cm., ellipsoid, lumpy-rugose, with one face very deeply convex and the other shallowly so. Almost glabrous shrub or small tree 2–6 m. tall; trunk cylindrical; outer bark peeling in dull yellow or grey flakes from the green under-bark; slash pale or reddish, smooth; exudate usually sparse, ± aromatic, producing a hard yellowish gum-resin; both long- and short-shoots usually spine-tipped, young twigs glabrous. Leaves all 3-foliolate, often glabrous but sometimes with rather long flexuous golden hairs at the bases of the leaflets and the petiole which is usually about as long as the central leaflet but sometimes, especially on short-shoots, much longer and sometimes on long-shoots much shorter; terminal leaflet obovate or rhombic, rounded or pointed, cuneate-attenuate at the base, 7–35 mm. long, 8–22 mm. wide, with 3–6 deep crenations usually above the middle on each side; lateral leaflets usually similar in shape but 1/3–2/3 as long, sometimes almost orbicular with a wide basal angle and with teeth nearer the base. Flowers greenish yellow, precocious, glabrous, the ♂ 20–40 together in dense clusters of very short cymes, the ♀ 2–6 together; pedicels ± 1 mm. long; receptacle cupular ± 1.2 mm. deep and 1.5 mm. wide. Calyx ± 2.5 mm. long including triangular lobes ± 1 mm. long. Petals linear, reflexed near the pointed tip, 4–5 mm. long, 1 mm. wide. Filaments 5 and 3, anthers 1.1 and 0.7 mm. long. Fruit-stalk 0.5–2 mm. long; drupe flattened ovoid or ellipsoid, usually distinctly beaked, sometimes merely acute, 10–13 mm. long (including a 0–3 mm. beak) × 7 × (3.5 + 4) mm. ; pseudaril almost entirely surrounding and closely clinging to the rugose stone, sometimes shortly 4-lobed at the tip; stone ovoid, pointed ± 8 × 5 × (2.5 + 3) mm. with small but well-defined apical pits; sterile cell convex, thickest below the middle, resembling the fertile cell but rather smaller, the stone thus appears 4-gonous when viewed from above. 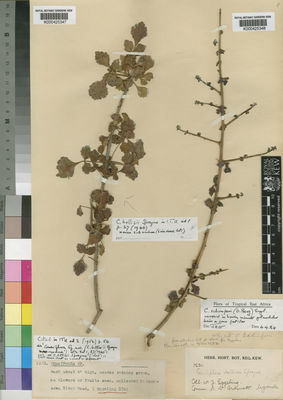 Bushed grassland and Acacia, Commiphora bushland; 430–1890 m. (this species and two varieties of C. africana reach the highest altitudes attained by Commiphora in East Africa) rainfall 450–700 mm. Vollesen in Fl. Eth. 3: 454, fig. 123–7 (1990). Van der Walt in Flora of Southern Africa 18: 9 (1986). Van der Walt. in Bothalia 11: 65, figs. 20–26 (1973). Wild in Flora Zambesiaca 2: 277, t. 52A (1963). Dale & Greenway, Kenya Trees and Shrubs p. 92 (1961). J.P.M. Brenan, Check-lists of the Forest Trees and Shrubs of the British Empire no. 5, part II, Tanganyika Territory p. 83 (1949). Schwartz, Fl. Trop. Arab. : 128 (1939). B.D. Burtt in Bulletin of Miscellaneous Information, Kew 1935: 108 (1935). Engl. in A. Engler & K. Prantl, Die Natürlichen Pflanzenfamilien, ed. 2, 19A: 435, fig. 204C–D (1931). Engl. in A. Engler & O. Drude, Die Vegetation Der Erde, IX, Pflanzenwelt Afrikas 3(1): 795, fig. 371N–Nb (1915).